Every Winter we're bombarded with songs of seasonal cheer. No matter where we are in the month of December, whether shopping, driving, eating out, at work, wherever, we just can't escape Rudolph, Frosty, Santa, and the rest of the crew. Depending on the first time we heard them, some of these songs stick in our heads and start the memory train running. I have to admit for me it's all about the chestnuts. 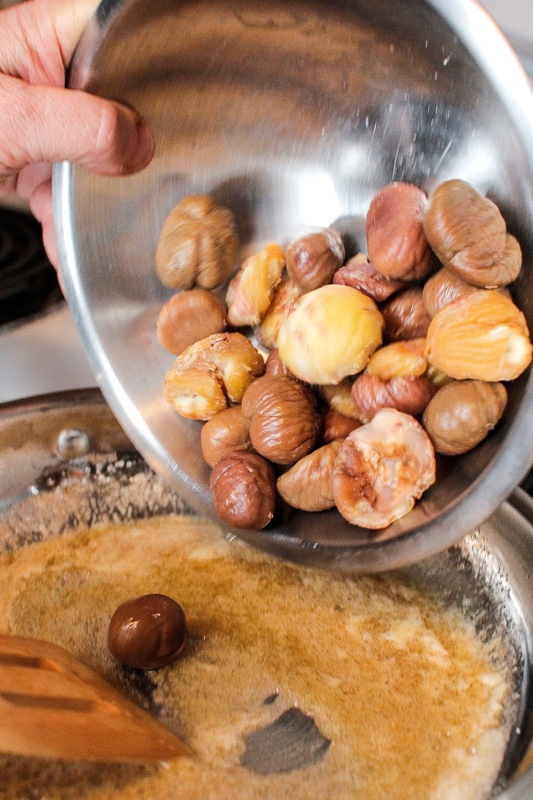 When I first heard that song about chestnuts roasting on an open fire I'd never seen a chestnut, and since my dad was a San Francisco Fireman, open fires represented family fire drills and being lowered out the back window to my dad, by my mom. For years it seemed as though I'd never get near a chestnut. Seeing as how the American Chestnut Blight wiped them out on this continent way back when. You know how it is when someone says one can't have something, it only makes one want it more. I developed a real chestnut habit. I started looking for them in markets, I bought them jarred, tinned, bagged. I never asked where they came from. I didn't care. They were the spirit of the Holiday for me. I stuffed turkeys with them. I made a heart-stoppingly (it had 12 egg yolks) delicious chestnut ice cream from a recipe that a homesick Belgian gave me. One thing I'd never done however was roast and shell them myself. Until this year. 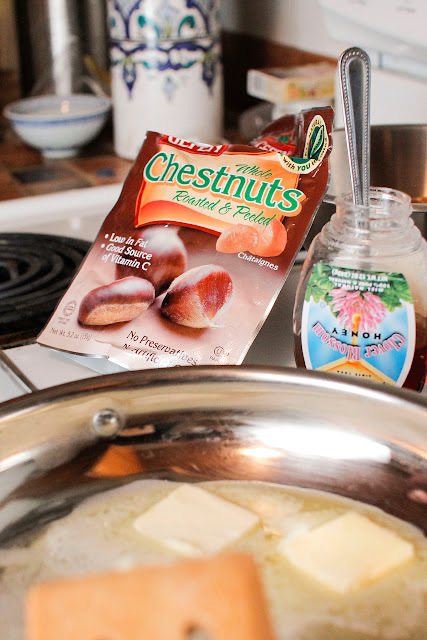 I have to admit, the song makes it sound easy, and online there are a million websites that offer info for home cooking fresh raw chestnuts. It shouldn't have been hard right? Wrong. The first chestnut error was my fault. 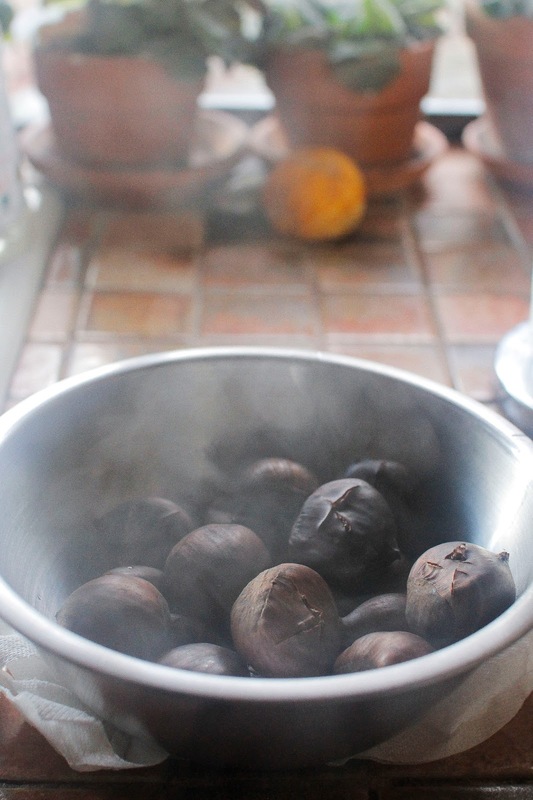 I'd decided to roast and spice some chestnuts. I bought a pound of chestnuts, so far so good. Then I got the flu. A week or more passed and the chestnuts just sat there. How was I to know they'd go bad? They were in a freaking shell. That should have been some protection. It's not like they were standing out on the corner in their underpants. However yes, they do spoil and in fact when they spoil they're just plain nasty. I chalked it up to the hazards of being sick. So after one chestnut roasting experiment went South, I read up on how to check up on chestnut freshness. I learned about squeezing the shell, looking for give, feeling for weight, checking for rattle (bad sign) I was looking for firm glossy and dark. I shopped for chestnuts again. I thought I was golden. For the second time I bought 2 dozen Italian chestnuts. I was going to glaze them in a sweet combo of spices and honey, put my feet up in front of the fire and feel seasonal cheer. What happened was not exactly what I was expecting. Turns out they were bad also. Or rather they were bad except for about 5 of them. I went back to the market and showed them my rancid chestnuts and the manager gave me a bag of chestnuts as a substitute. The fresh chestnuts were Italian, the bagged ones were from China. 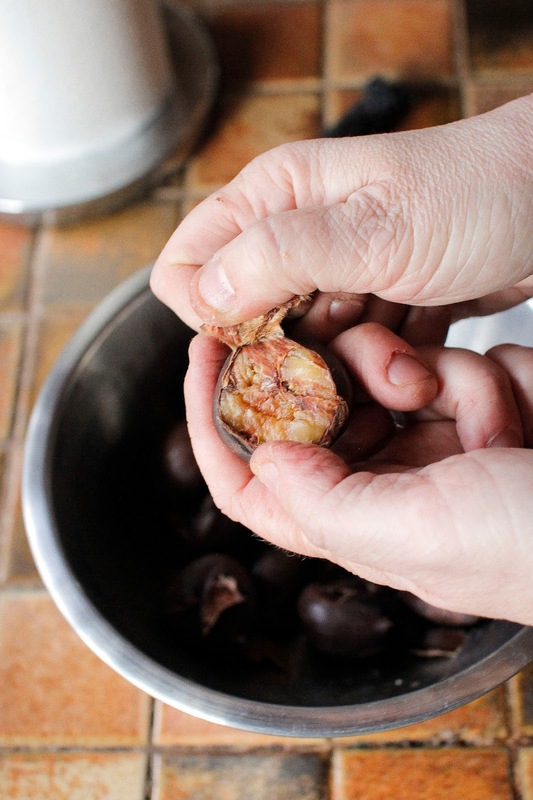 Yes there was a difference, but if you can get hold of good quality chestnuts here's how to fix them. 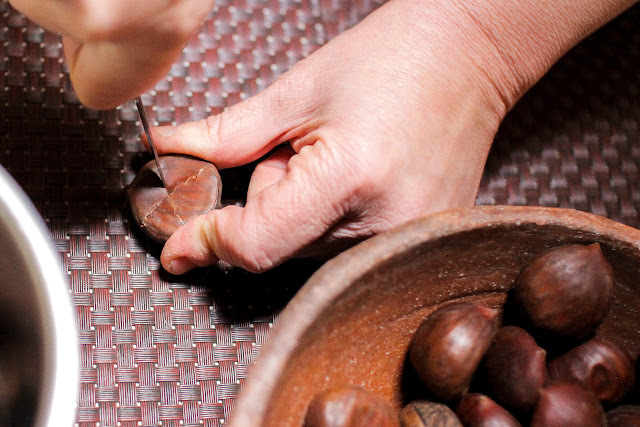 Cut an X on the chestnuts on the flat side of the shell. Put the chestnuts in their X marked shell into a pan of water. 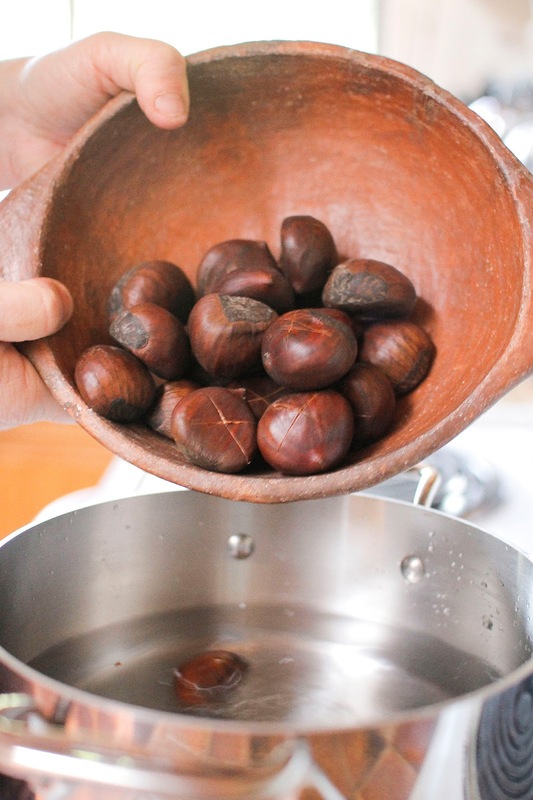 Once the water starts boiling, boil the chestnuts for about 5 to 10 minutes. In a saucepan heat 4 Tbs of unsalted butter. When the butter starts to melt add in 3 tbs of honey. When the mixture has melted together add in the salt, cayenne, and cinnamon. 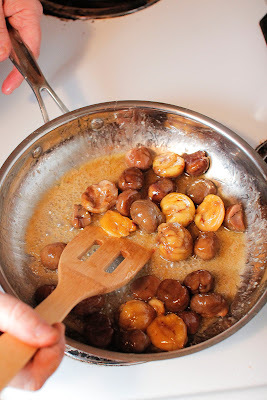 Put the peeled chestnuts into this mixture. Swirl them around in the butter, honey and spice mixture until they're coated. 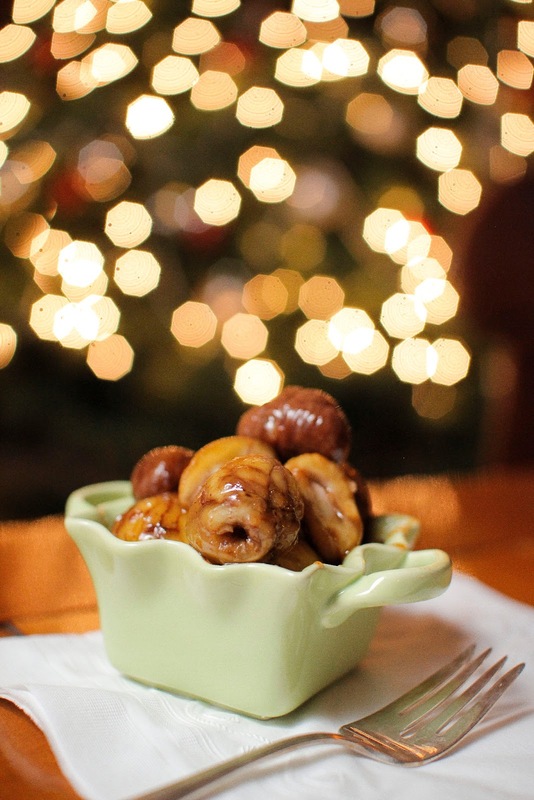 Serve them up drizzled with the honey mixture. So how were they? Let's put it this way. I liked them. Alan as it turns out is not a chestnut fan. He'd eaten them before in ice cream or with a turkey wrapped around them, but on their own? Not so much. So all that work for a handful of nuts coated in spicy honey. I thought they were a tasty experiment, but too labor intensive. So much for the chestnuts. Hello I found your articles very interesting, I visited your website and I noted a few recipes. From Spain, I invite you to visit my blog kitchen located in Valencia each week, I'll update is very positive on food crops. Well, to each his own, as the saying goes. 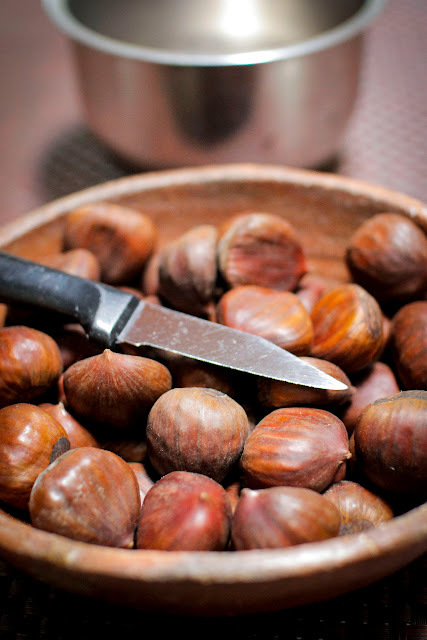 I *love* chestnuts. Had some roasted chestnuts last night washed down with a nice single malt while watching Casablance by a crackling fire. I was in heaven!